Stephen Kenwright is 30 years old and lives in the countryside near Leeds and is planning on getting married next month. He also is the proud dad to a border terrier, he tells me. Stephen is a blogger and also a conference organizer. He writes a ton at Drum magazine and on other industry blogs. 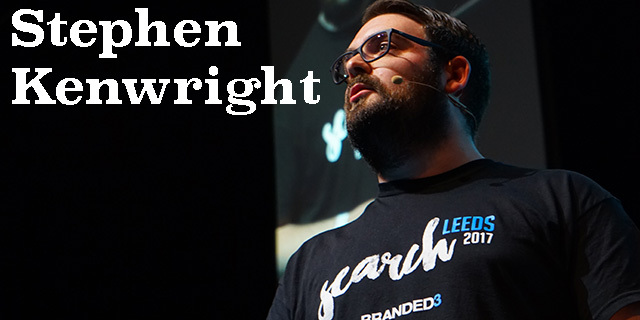 He also is a founder of the SearchLeeds conference. Oh, and with all of that, he is also the strategy director of Branded3, an SEM firm. Like I've said before, managing conference is such an awesome way of giving back to the community - it does so much good for those who attend. The blogging is super important as well, because that can reach a much larger audience, where he can share more to more people. Stephen has worked in the Search Industry for over 8 years now and in that time has developed into an industry thought leader in the UK and overseas. He's been pivotal in building and executing Branded3's strategy, delivering world class results for clients and speaking at every major conference in the UK. Stephen has brought in multi million pound deals over the years that have transformed our agency, he has led SEO and content strategies, doubling the size of the teams in the last 3 years. He has played a key role in building SearchLeeds, a focussed conference in the UK that now attracts more than 2,000 attendees. He is a bright, forward thinking Search Marketer that consistently adds value to our business and the wider industry. Stephen Kenwright Bio: Stephen is strategy director of Branded3 – a 15 year old, UK-based search marketing agency owned by the St. Ives Group – where he works with high street and international brands across SEO, PPC, CRO and analytics. He trained as a copywriter and graduated with a MA in Shakespeare and Renaissance Literature from Sheffield Hallam University, where he now mentors communications students. He’s also a blogger for the Drum magazine and founder of the SEO conference SearchLeeds. Favorite thing about the SEM community? I love how much we share with each other – nobody hides what works and there are some very smart people who are willing to give up their time to help you out. I’ve been involved in the community for long enough now that I’ve seen people who were just starting to share their knowledge now paying it forward and helping out the next “generation” of search marketers. This gives me a lot of confidence that the industry is here to stay. One piece of advice to the SEMs out there? Continuous evolution forced by Google’s changes has given you a broad and valuable skillset that marketers in other channels should be envious of. Full stack marketers are rare – but SEO is a breeding ground for them. Technical knowledge, analytical skills, creative thinking and the ability to talk to colleagues and clients who might be marketing directors, developers or PR executives aren’t something that everyone gets trained in. What you want to be known for in the SEM space? I want to be known for helping to push the Northern digital economy in the UK to the forefront internationally – there are some super smart people in big agencies and successful brands in Leeds and the surrounding areas – I’m doing my part to try and put this area on the map with SearchLeeds and our events for Leeds Digital Festival. Besides this, I’ve had some big shoes to fill after Branded3’s founder Patrick Altoft retired, so if nobody thinks I broke the agency I’ll be very happy indeed! To learn more about Stephen check out his agency, connect with him on LinkedIn and follow him on Twitter.